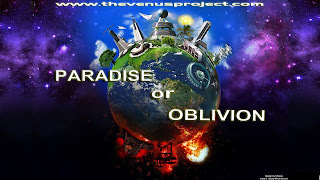 Paradise or Oblivion is a free online documentary film by the Venus Project that details the root causes of the systemic value disorders and detrimental symptoms caused by our current established system. This video presentation advocates a new socio-economic system, which is updated to present day knowledge, featuring the life long work of Social Engineer, Futurist, Inventor and Industrial Designer Jacque Fresco, which he calls a resource based Economy. The film details the need to outgrow the dated and inefficient methods of politics, law, business, or any other "establishment" notions of human affairs, and use the methods of science, combined with high technology, to provide for the needs of all the world's people. It is not based on the opinions of the political and financial elite or on illusionary so called democracies, but on maintaining a dynamic equilibrium with the planet that could ultimately provide abundance for all people. Occupy Wall Street : The Revolution Has Begun !